AT THE MELVILLE HOTEL, we pride ourselves on offering our guests the highest standards of hospitality and that’s why so many of our guests return year after year. Whilst staying with us guests can also enjoy a drink in The Bethell Lounge, where we offer a variety of live entertainment, music and dancing on most evenings. The bar serves over 50 varieties of whisky including Scottish malts, Bushmills and Welsh Penderyn. There is a range of beers on tap and bottled as well as ciders, Guinness and Budweiser. There is limited private parking available on site and we will reserve you a spot if one is available there is a charge for parking on site at £10 for 24 hours. There is public car parking available within 5 minutes or less from the hotel. At the Melville, we serve a full English breakfast if requested, or your choice of cereals, fresh fruit, toast and coffee or tea. If you would like to add an evening meal to your stay simply, ask our reception to arrange this for you. All the rooms have a flat screen TV, tea & coffee facilities, and are ensuite with either bath or shower. There is a TV lounge for morning coffee or an afternoon tea break. There is a lift/elevator that serves all the floors of the hotel and we have 24-hour porterage and security. The Hotel is situated a few minutes away from the iconic Blackpool Tower, and right across the road from the Winter Garden's Theatre and a short walk from The Grand. 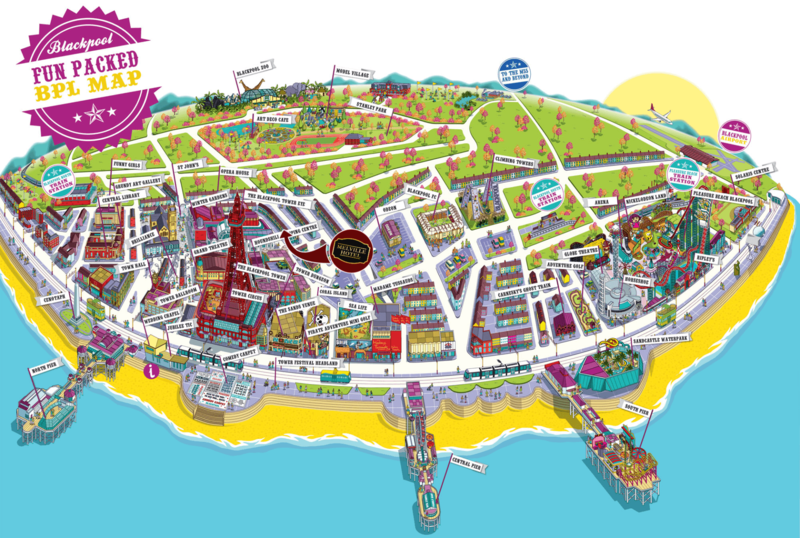 Within easy walking distance you will find plenty to entertain great restaurants to dine at or have some of Britain's best fish & chips. Blackpool Pleasure Beach is a 10-minute car ride away, this incredible old-school amusement park with vintage wooden roller coasters and great live entertainment is fun for all the kids. Don't forget the famous Blackpool Illuminations that take place throughout September and October and a variety of festivals held over the course of a year from the Rebellion Punk Festival to the World Fireworks Festival. Make Blackpool your base to explore Lancashire from the infamous Pendle Hill and the Pendle Witches an hours drive away to the Forest of Bowland an Area of Outstanding Natural Beauty. A mere 10 minute car ride away is the delightfully Victorian and Edwardian Lytham St. Anne's where you can choose from four Golf Clubs to play a round. We offer a full English breakfast. As well, as toast, fresh fruit and a range of cereals and juices to choose from each morning..
Our bar at the Melville Hotel is well stocked and we also have a pool table and dart board for you to enjoy. The TV lounge at the Melville is always a hit with our guests it's warm, comfy and with a fresh cup of coffee or tea in hand it makes for the perfect place to relax after a long day out in Blackpool. Every one of our rooms at the Melville Hotel are ensuite and you can choose from either a shower or bathtub ensuite. Unfortunately, here at the Melville we have very limited parking availability and a spot can be reserved for you, or there is public parking no more than five minutes walk away. (There is a charge for parking on the premises). If your legs just aren’t what they use to be or you are simply exhausted from all Blackpool has to offer at the Melville we have a lift to all floors. The Hotel has Free Wifi throughout the hotel; however due to the thick concrete walls some rooms do suffer with a poor signal even with all the boosters installed. 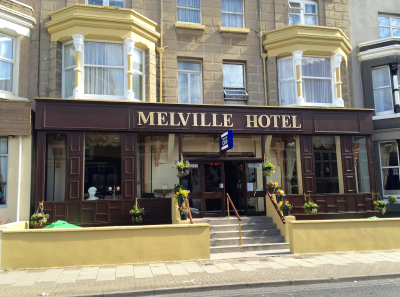 The Melville Hotel is located right in the heart of Blackpool just steps from the town centre and the major attractions such as the famous Blackpool tower and the Blackpool promenade. Providing your pet is friendly, we are pet friendly we allow you to bring your beloved best friend along with you during your stay as long as you provide sufficient care for your pet whilst your here. There is a charge of £10 per day.